Our focus for the year was learning about the former West Elmwood neighborhood that was commonly referred to as "Across the Tracks." This rural and integrated neighborhood was displaced by the Huntington Industrial Park in 1962. 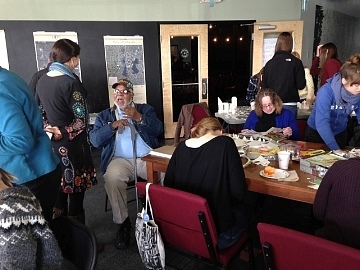 We kicked off our public workshops in February at Renaissance Church in Mashapaug Commons with presentations by Ed Hooks, a former resident of the West Elmwood neighborhood, and Lucy Boltz, a Brown University graduate whose thesis focused on exposing this neighborhood's history. Mr. Hooks shared childhood stories about catching frogs, swimming, and playing boyhood pranks. Lucy spoke about gathering oral histories from former residents and researching the decision making behind the selection of this site for urban renewal. Bob McMahon, Superintendent of the Providence Parks Department, and Amelia Rose, Director of the Environmental Justice League of Rhode Island, also spoke about the environmental impacts of the Huntington Industrial Park on Mashapaug Pond. The park is one of the hottest spots in Providence. Its abundance of impervious surfaces leads to rainwater runoff, which creates algal blooms in the pond every summer. They pointed out various mitigation efforts underway in the neighborhoods surrounding the pond and highlighted a showcase Environmental Protection Agency rain garden project slated for JT Owens Park. 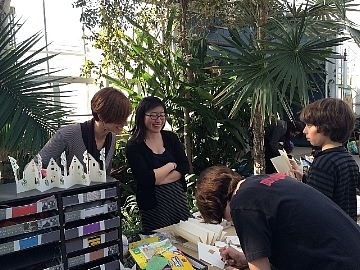 Throughout the spring of 2014, Kate Diedrik, a Brown University Public Humanities graduate student, and different UPP artists led public workshops in various sites including Roger Williams Park Zoo, Roger Williams Park Botanical Center, Roger Williams Middle School, and the JT Owens ball fields. 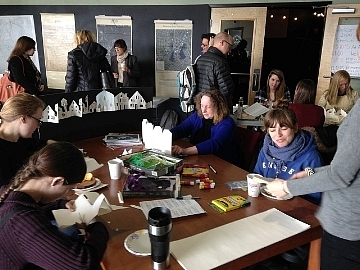 During the workshop, participants created "healthy neighborhood" accordion foldout houses while learning about the environmental benefits of rain gardens and the former West Elmwood neighborhood. 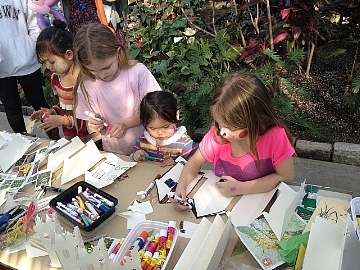 At Roger Williams Park Zoo's "Party for the Planet," happy attendees created accordion foldouts of their "healthy neighborhoods" with artist Kristina Brown. 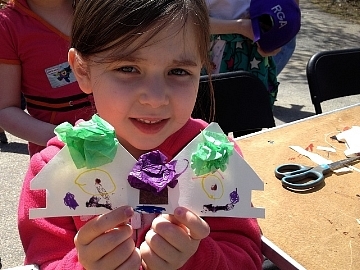 Children of all ages created houses at the Roger Williams Park Botanical Gardens, co-facilitated by Genise Choy. 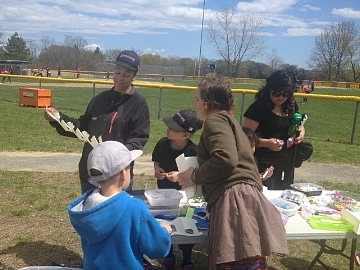 The workshop at JT Owens ballfields drew many participants from the parents and siblings who had stopped by to watch the Little League games taking place. 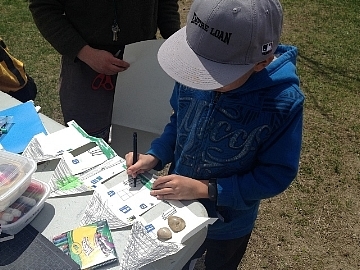 Artist Megan Harris actively engaged with the kids that joined the workshop. 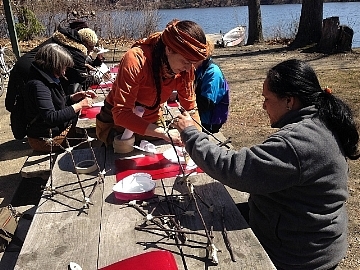 On a sunny day, just weeks before the Procession, adults gathered by the pond at the Mashapaug Pond Boating Center to make lanterns for the Procession. During the summer and into the fall, UPP supported an artist residency, which resulted in a floating lighthouse inspired by the stories of Mashapaug Pond, entitled Beacon. 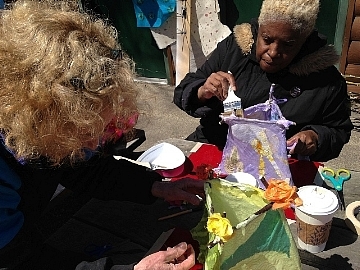 Having been a UPP Arts teaching artist at Alvarez High School the previous spring, artist Kristina Brown was familiar with the history of the pond and the oral histories that had been gathered. That experience coupled with a background in theater design (she worked and lived on Miss Rockaway Armada, an Art Raft Installation by Caldonia “Swoon” Curry on the Mississippi River in 2006), printing and community organizing, Kristina brought a wealth of talent and interest to creating a piece for the pond. 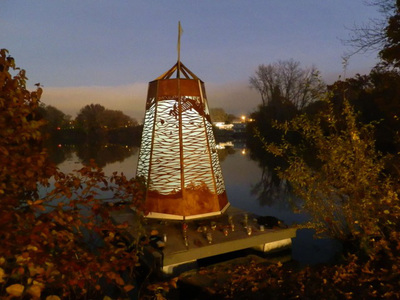 She envisioned Beacon as a solar powered floating sculpture to “hold a source of great light at its core.” The light would shine through cut-out illustrations, depicting a new future for the pond. As she worked on cutting out the various imagined scenes on 8 plywood side panels of Beacon in the backyard of her home, she realized she wanted to involve the public more in the project. 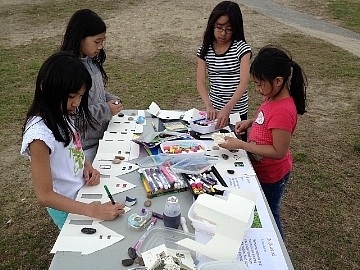 She gave presentations about the pond to various audiences including New Urban Arts, Sophia Academy and Alvarez High School and asked that individuals bring her a special object to be included in the sculpture. As she reached out to various individuals in formal talks and informal encounters, she found that many did not know that Mashapaug Pond existed. 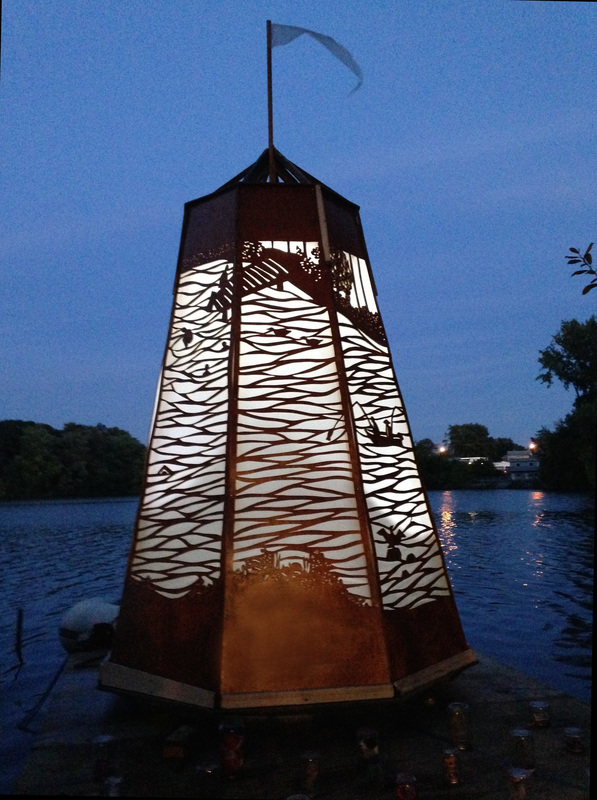 The sculpture was installed on the pond from October 4 until November 9, 2014.